I have seen a lot of reviews about the 50th anniversary Sgt. Pepper album, but nothing about the Blu-Ray/DVD that comes with it. So I figured for tonight "Wednesday Review" I would tackle the video portion of the set. I watched the Blu-Ray version, but the DVD is the same thing. The main part of the DVD is the 1992 documentary called "The Making of Sgt. Pepper." This official Apple production was originally shown in the United States on the Disney Channel (back in the days when you had to pay extra for that channel) in the Fall of 1992. I was a fairly new Beatles fan when I saw it on a weekend "free trial" of the Disney channel and it totally blew me away at the time. 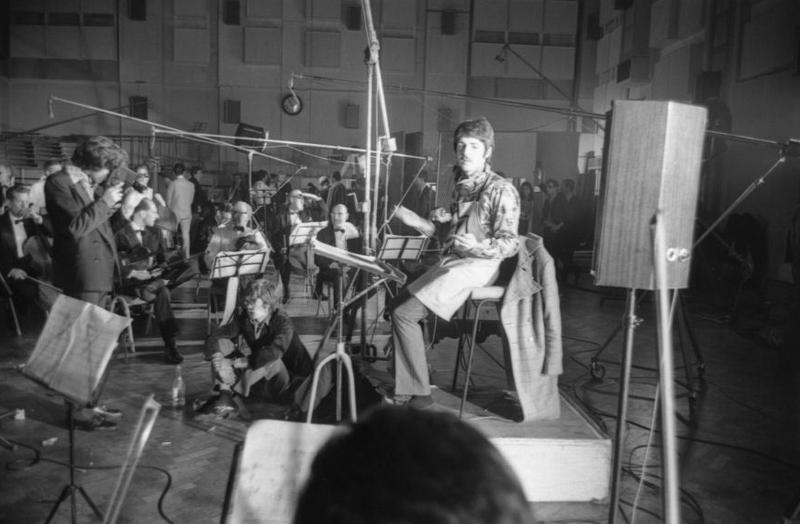 It was the first time I had ever heard John's isolated vocals for "A day in the Life" or the "sugar plum fairy" beginning to Lucy in the Sky with Diamonds. It is about time this documentary came out on Blu-Ray or DVD! It should have been out on VHS a long time ago (Maybe it was after it was first shown, but I never had it). This was made in April 1992 and you get to hear first hand experience about the making of the Sgt. Pepper album directly from George Martin, George Harrison, Paul McCartney, Ringo Starr, Peter Blake and others. Since at least two of the men involved are no longer with us, this is a treasure. I love see George Martin behind the mixing board. He really seems to get a bit emotional when he is hearing John's voice and when he is talking about John. You can see how proud he was of the work he did on Sgt. Pepper and it really drives home the fact that without George Martin, the Beatles would have been a totally different group. 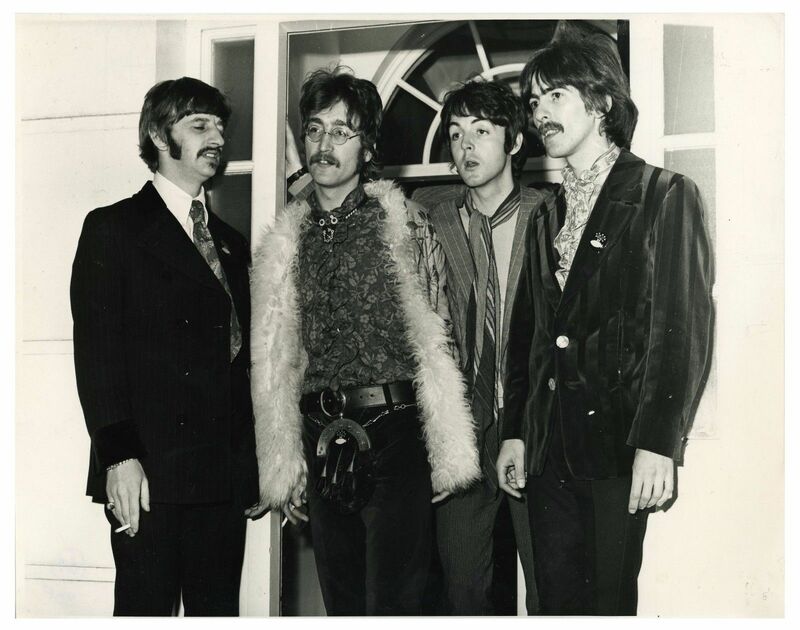 I especially enjoyed seeing George M. and Paul together at the board talking about Paul's bass playing on "Lucy." I do think that documentary was way too short. It is only 45 minutes long and they do not talk about all of the songs on Sgt. Pepper. "Fixing a Hole," "Lovely Rita," "She is Leaving Home," "Getting Better," are all missing. I was hoping that when this was released for the 50th anniversary, we would see more of what was filmed. Surely there were things that were originally edited out. I enjoyed most of the interviews with the non-Beatles people. Peter Blake was interesting. The guy that played the trumpet on "Penny Lane," was neat to see. Even Brian Wilson was interesting. However, Phil Collins really seemed out of place and not needed. It is almost like that stuck Phil in there because it was 1992 and he was popular at that time. The rest of the Blu-Ray was filled with the promo films for "a Day in the Life," "Strawberry Fields," and "Penny Lane." They really weren't necessary because we just saw this on the Beatles 1 DVD release. It feels like they just stuck them on there because the documentary was so short. It was disappointing that a new film was not released for the 50th anniversary, although as I said, I think the 1992 film is a classic and I am glad that it was preserved and looks much better than the Youtube videos. It is a nice addition to the CD set, but would not be worth buying just for the DVD alone. Ah yes I've got that documentary around here somewhere on home-made dvd I think. It is a bit cheapskate of dvd producer not to fill out the disc with other substantial suuplements. I can tell you why the doc is 45 mins, if it's the same one I have around here somewhere. The documentary was made for an arts series called THE SOUTH BANK SHOW, on ITV which is a commercial network. So, unlike the BBC, an 'hour' long slot is actually closer to 45 minute program cos they interject ads. That's why the doc is 45 mins I think, because of the original format that the source was intended for. There was another 1 minute to the original program because the series host, Melvyn Bragg, introduced and closed each program, which I assume was cut from the blu-ray making it even shorter. It was expected that way on telly back in 1992 or whenever it was, but on a blu-ray it's going to look very cheapskate when you think about the potential megabite volume on a disk. The dvd producers should have realised that really. That's how I remember it, Mark. Right after the very brief piano preamble. I remember seeing this on DVD-R around 2003-2003. A one-hour TV show minus commercials will only run about 45 minutes, unfortunately. I also saw a U.S. broadcast that edited out all references (and stock footage) of drug use, hah! And what about the 5.1 surround mix of the album? Hello Sara, about the Phil Collins "not needed appearance" in the documentary. Phil was a closer guy to The Beatles when he was a young boy and he appeared in the movie "A Hard Days Night" as an extra and later on I think he was a regular in the Apple years.